Sauerkraut is popular in many cultures because it contains beneficial probiotics that support the digestive system. Sauerkraut can be found at most grocery stores and farmers’ markets, but it’s also incredibly easy to make your own! 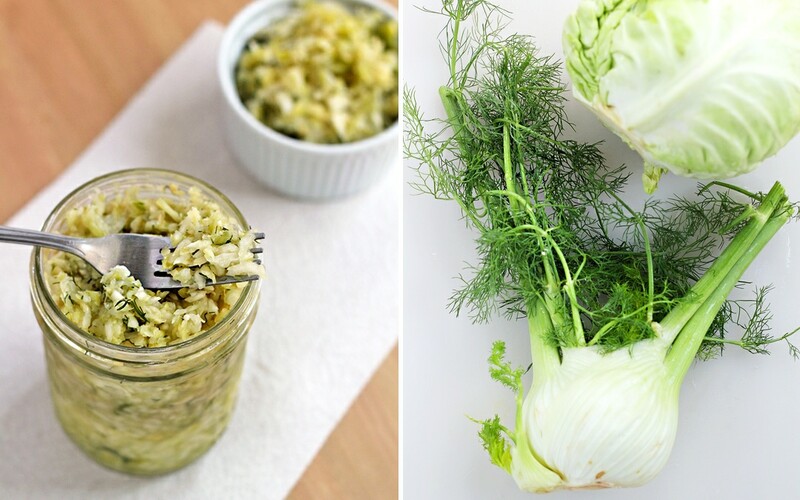 This recipe is a fun twist on traditional sauerkraut because it adds fresh fennel for an anise-like flavor and is a great way to try fermenting foods on your own. 1. Add the shredded cabbage and fennel to a large ceramic crock and mix with sea salt. 2. Using clean hands, massage the cabbage to work the salt in and help break down the cellular walls. 3. Leave the cabbage to sit for about an hour. At that point, the cabbage should be much softer and there should be a fair amount of liquid (brine) in your bowl. 5. Allow the sauerkraut to ferment for at least 24 hours and then taste it. Be sure to check the brine level and make sure the cabbage stays submerged. Ferment for at least 2–3 days, and up to a week (for a stronger taste) if desired. 6. Once the sauerkraut has achieved the desired taste, store it in the fridge. As long as it stays submerged below the brine, it will easily keep for months. Note: If there is not enough brine to cover the cabbage, you can mix salt with water to create a brine. Mix 1 tablespoon of salt with 1 cup of water, stir until completely dissolved, and use this to cover the cabbage.